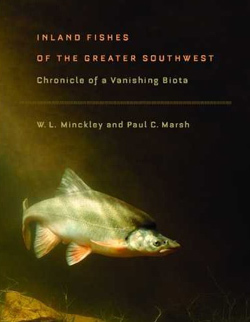 Inland Fishes of the Greater Southwest: Chronicle of a Vanishing Biota. This new volume updates and significantly expands on the long-out-of-print “Fishes of Arizona” published by Minckley in 1973, and will appeal to professionals and lay-persons alike. This comprehensive new book replaces and substantially expands upon the landmark Fishes of Arizona, which has been the authoritative source since it was first published in 1973. Inland Fishes of the Greater Southwest is a one-volume guide to native and non-native fishes of the lower Colorado River basin, downstream from the Grand Canyon, and of the northern tributaries of the Sea of Cortez in the United States and Mexico. In all, there are in-depth accounts of more than 165 species representing 30 families. The book is not limited to the fish. It provides insights into their aquatic world with information on topography, drainage relations, climate, geology, vegetational history, aquatic habitats, human-made water systems, and conservation. A section of the book is devoted to fish identification, with keys to native and non-native families as well as family keys to species. The book is illustrated with more than 120 black-and-white illustrations, 47 full-color plates of native fishes, and nearly 40 maps and figures.